Looking for a truly special statement piece? Check out Titanium Jewelry's new arrivals. This section includes just-added stylish titanium rings, tungsten rings, gifts and accessories for cutting-edge jewelry aficionados. Pick a men's wedding ring that's edgy and anything-but-ordinary, or find great gifts for your groomsmen or bridesmaids. Black titanium jewelry makes the best gift for the rule-breaking jewelry-wearer, while tungsten speaks to those who like to stand out in a crowd. Click to Read More. These pieces are uncommon as they come. Here you'll see jewelry made by the jewelry industry's most pioneering designers. This ensures you get a style that feels tailor-made for you. There's no replacement for this level of quality. But our prices are perfect for those that are trying to adhere to a budget, with many price points available. 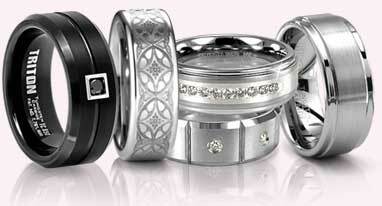 Titanium Jewelry is a family-run jeweler in business since 1988. You'll feel confident buying jewelry from our store thanks to our 30-day money back guarantee and 5 year warranty. Check back often to find more brand-new titanium and tungsten jewelry that speaks to your inner-renegade.